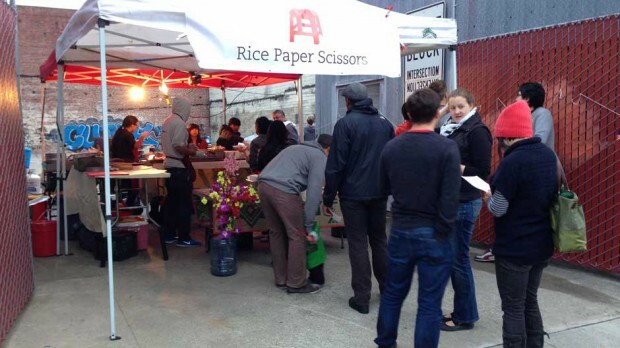 The NWBLK hosted a movie night as a collaboration between local fixtures Rice, Paper, Scissors and Alite Designs, featuring Wet Hot American Summer. We arrived early, around 4 o’clock, with just enough time to grab a cappuccino at Blue Bottle Coffee in the new Heath factory down the street. For those of you that live in another part of the world, you’ll find out about Heath Ceramics and Blue Bottle soon enough. 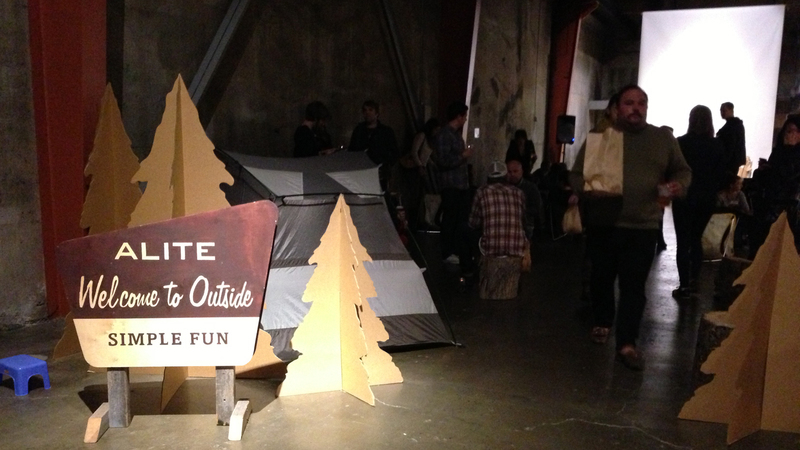 It seemed to be on the verge of raining all day, setting the perfect mood for an indoor, camping themed movie night. Outside, Rice, Paper, Scissors was busy cooking their tails off, whipping out bowls of pho faster than you can teach your mom to pronounce pho (not saying much, it’s been 3 years here and very little progress to speak of). Rice, Paper, Scissors has some of the best Vietnamese food in the city, with nasty rich beefy pho, fluffy-delicious Banh Mi, and a bunch of other things we wanted to try but got too full to this time around. Inside, The NWBLK had been transformed into a national park complete with cardboard trees, sleeping bags, a wicked cool tent, and about 200 of the most comfortable camping chairs in history. I’m still not entirely sure of the physics at work behind those chairs, but I was able to rest comfortably on them despite having a very poor sense of balance and 3 IPA’s from Southern Pacific Brewing. 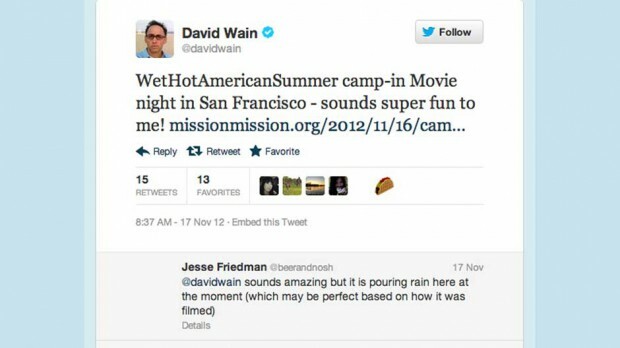 The movie for the night: Wet, Hot, American Summer. 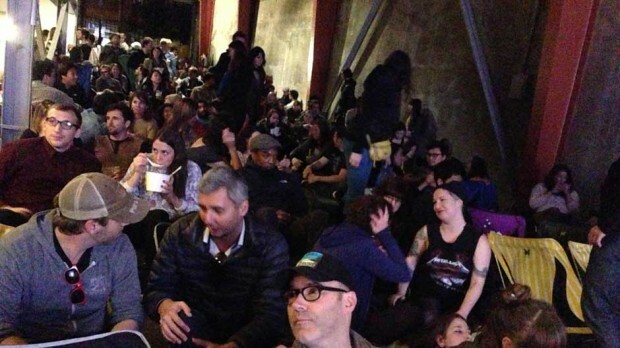 The movie’s director, David Wain shouted out the event on Twitter, and by 6:30, all of the chairs were being cautiously guarded and the event became standing room only. The final tally was somewhere north of 250 campers, all laughing hysterically at the 80’s summer camp throwback. 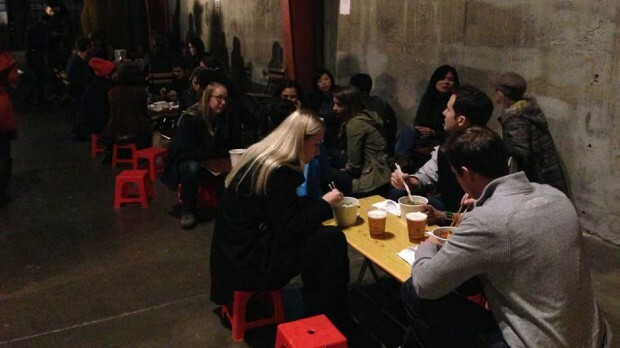 More importantly, the event is just another in The NWBLK’s meteoric rise in SF’s Mission District. The NWBLK is emerging as a cultural fixture, morphing into a weird and successful combination: you can eat lunch at gourmet food trucks, walk around the interior as though it were a museum, purchase some killer clothes from the likes of N.I.C.E. Collective, and furnish your apartment with a one-of-a-kind piece from the most exciting artists in the world. Bikoo is proud to be working with The NWBLK, and endeavors to capture the same kind of dynamism that makes The NWBLK special.